Are you aware of the fact that problems could be lurking in the sewer pipeline at your residential, commercial, or industrial real estate, particularly if it is over forty years old? Would you like to discover these issues before they become far more serious? A sewer camera inspection is the only way to know exactly what is going on with the sewer pipes that are buried underground at your home, place of business, or investment property. It happens to be a non-invasive and affordable procedure that you should take part in on a regular basis. Thanks to recent advances in plumbing and video technology a qualified and experienced plumbing contractor, like Nu Flow Technologies can detect even the most minuscule issues with the sewer system. The process takes less than an hour to complete and can save you a tremendous amount of money in avoidable sewer pipeline repairs down the road. At this point, you may be curious as to how the procedure works. 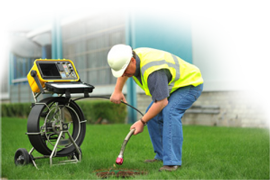 A technician will arrive at your property and begin the sewer camera inspection by locating an established access to the sewer system such as a drain cleanout. The next step is to insert a flexible rod that contains a tiny, waterproof video camera into the sewer pipes through the access point. The rod is adaptable enough that it can make its way through the entire system including around any bends, corners, and turns. As the rod is moving through it is taking high-definition video images of the interior surfaces of the sewer pipeline. The images are transmitted back to the technician in real time where they are viewed on either a laptop computer or other electronic devices such as a tablet or smartphone. The high-definition video is so crystal clear it is like having a live set of eyes inside the sewer pipes. Even the smallest problems or potential problems can be seen by the technician on the video screen. At that point, he or she is able to determine if the sewer pipeline has a clean bill of health or needs further attention. Often times the issues are small enough that they do not require an immediate fix and can be tracked with future sewer camera inspections. If the problems are large enough that they do require immediate attention than the technician will formulate a repair plan. It is similar to a doctor discovering a small ailment and treating it prior to the issue becoming a major medical emergency. When the process is complete the property owner is given a copy of the video for their records. The plumbing contractor will also refer to it as a baseline for future inspections. Plumbing experts highly recommend scheduling a yearly sewer camera inspection in order to ensure that the sewer system stays in good working order. Nu Flow Technologies has been in business since 1998. We helped to invent the trenchless sewer repair industry. Our goal is to provide customers in the Florissant, Missouri area with the best service at prices that will not break the bank. We are here for you each and every step of the way.